Buford Betty: Grab the milk and bread, and TAKE COVER! I am so jealous! I got a call this morning from my 8-year-old sister telling me that it was snowing...here on Rocky Top we got NO snow accumulation! I am a little glad though because I would still have to trudge to class in the snow. Gorgeous pics!! It's supposed to snow up here in VA and I really hope it does!! I would LOVE to have a snow day tomorrow!! I KNOW! We were so excited at our house and we played in the snow this afternoon...just long enough to make a pitiful (but very sweet) snowman. 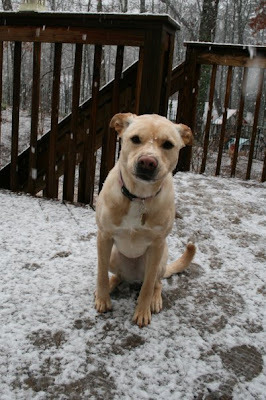 I AM LOVING THIS SNOW & SO ARE MY SWEET PUPPIES! Great pictures! We got about an inch, just enough! The kids had a blast! I hate snow, but I am all for it if it gives me a snow day tomorrow! I'm almost positive we will have one, but I'd like it to be called tonight so I don't get a phone call at 5:00am about it from the school I work at! The snow looks beautiful - your street is so pretty! I happened to be in KY when they got their big Ice/Snow storm, so I had a winter this year. But hubby was asking for just 1 snow, too....He did get his wish. We saw snow in Roswell after church, but nothing up here at our house. It was the perfect snow day! Janie and I had a blast playing at the park with all the other snow dogs!! So pretty!! I am so jealous!! 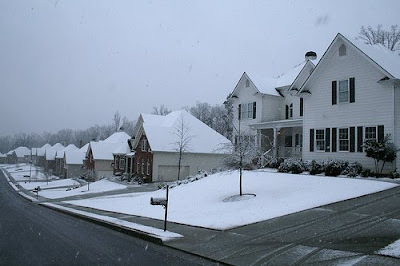 We got lots of snow up here in Greenville too - so pretty!! Our lab just loved it... Hope y'all had fun! Aw- Gertie is so cute sitting there! Did the South shut down with that *much* snow? Tehe. 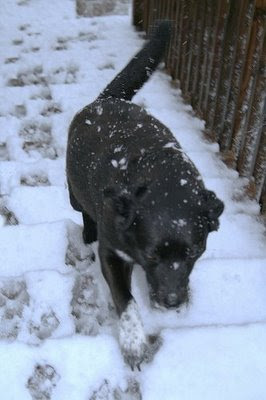 Sadie LOVES playing in fresh show- she leaps into deep snow piles. Has the south gotten it back together yet? Glad you got your snow wish. I am pretty much done with winter and everything that comes with it up here! Bring on some warmth!